Getting married by the sea? Or on a boat? On a sandy shoreline? Love blue and white? Then how about a nautical wedding theme? You may not have considered a maritime wedding look but it could work absolutely perfectly for you. Here’s how to get the theme together so it’s plain sailing. The classics for this style are blue and white – which are shades you really just can’t go wrong with – they never date. You can choose a traditional navy (after all, that’s why navy blue is so called) or if you fancy something a bit lighter, then go for shades of azure blue. Blue and white stripes are elegant, fun, engaging and decorative all at the same time. Start off by thinking about your wedding invitations. You can choose blue and white stripes or invoke the nautical theme by using symbols such as anchors. Or mix and match the two. Take the look through to your table plans, any signposting you have on your wedding day, your orders of service and your place settings. If you’re giving out favours, then you could serve them up in classic blue and white sweetie bags (or use them on a sweetie table if you’re taking that route). We also like the idea of little paper boats filled with white Polo mints – dot these around your tables or use as favours and place settings. And what about your bridesmaids? Maybe mix it up in blue and white for them too. Put some maids in ivory and others in navy. 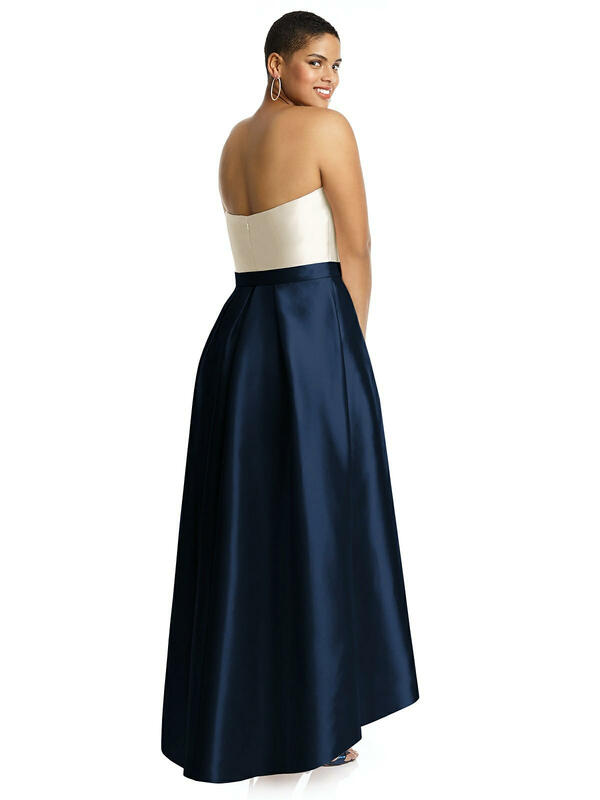 Or choose frocks in two shades, like this number from Dessy with a midnight blue skirt and ivory bodice. Or maybe you put them in white with navy shoes? If you’re having young pageboys and flowergirls, then perhaps you want to dress your page boys in sailor suits. Or with striped Breton tops? As for the decoration of your venue – go the nautical route and you’ll be spoilt for choice when it comes to props and décor. Talk to our stylists about giving your marquee or reception room the wow factor. We’re thinking white chair covers with blue sashes – interspersed with blue covers and white sashes. How perfect would that look? You could tie napkins with a maritime figure of eight knot in string. As evening draws on, make sure you have plenty of lanterns to light your guests’ way and give a soft glow to the proceedings. If you’re having a photo booth to entertain your guests, don’t forget to include props that fit your maritime look. Think Pirates of the Caribbean. Make sure you have a dressing up box nearby full of pirate hats, eye patches, a toy parrot … you get the idea. And if you’re having children at your wedding, don’t forget to decorate their table nautical style too (which is where you can draw on the ingenuity of one of our stylists). Serve little fish shaped biscuits. Maybe put shells with the child’s name on as a place setting. And if you have a chill-out room for later and you’re going to play a video, then Pirates of the Caribbean might be a good choice or The Little Mermaid if the children would prefer something Disney? If you like this idea, you’ll be amazed at how many options spring to mind once you start thinking it through. Talk to your bridesmaids and talk to your local Ambience venue stylist who’ll be able to help you source everything you need to get your nautical look shipshape and Bristol fashion!